Priority Sets are user defined criteria values that are entered and saved in Sensitivity Analysis. Priority Sets that are created in Sensitivity Analysis can be recalled and applied in Data Visualization and Optimization results screens. Priority Sets are unique and must be saved and named. Group Priorities data captured through Pairwise Comparison or Ratings Voting will not be changed and will remain the "primary" priority set for the decision by default. Change or modify a criterion weight in the Criteria Pane. Select Save As from the Priority Set Menu bar at the bottom of the screen. Title the Priority Set and record details of changes in the Description box. Click SAVE button to Save and create the Priority Set. 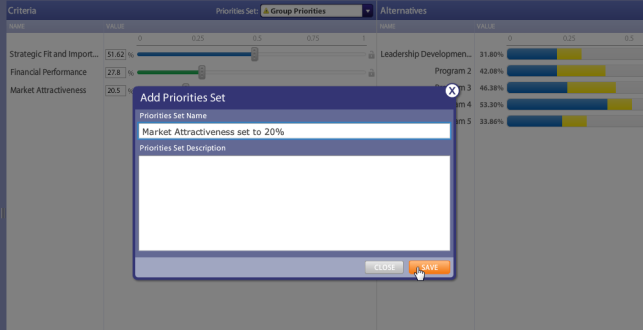 In the Custom Priorities listing, select from the list of Priority Sets. Then use the Priority Set menu to Save the changes or to Revert to the previous data. NOTE: To lock in a criterion value while dragging bars, click on the Lock image on the right side of the Criteria Pane. This while temporarily lock the criterion weight from changing. Peer weight will be distributed to the unlocked criterion based on the values. All criteria weights will sum to 100%.